In this second edition of their classic text, Klyza and Trombulak use the lens of interconnectedness to examine the geological, ecological, and cultural forces that came together to produce contemporary Vermont. They assess the changing landscape and its inhabitants from its pre-human evolution up to the present, with special focus on forests, open terrestrial habitats, and the aquatic environment. This edition features a new chapter covering from 1995 to 2013 and a thoroughly revised chapter on the futures of Vermont, which include discussions of Tropical Storm Irene, climate change, eco-regional planning, and the resurgence of interest in local food and energy production. 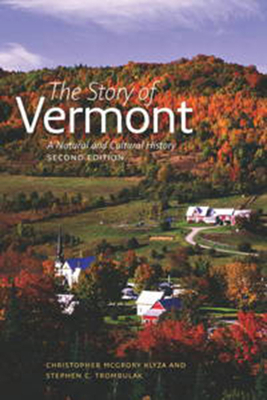 Integrating key themes of ecological change into a historical narrative, this book imparts specific information about Vermont, speculates on its future, and fosters an appreciation of the complex synergy of forces that shaped this region. This volume will interest scholars, students, and Vermonters intrigued by the state’s long-term natural and human history. CHRISTOPHER MCGRORY KLYZA is Stafford Professor of Public Policy, Political Science, and Environmental Studies, Middlebury College. His most recent book, co-authored with David J. Sousa, is American Environmental Policy: Beyond Gridlock. STEPHEN C. TROMBULAK is professor of environmental and biosphere studies, Middlebury College. His most recent book, co-edited with Robert Baldwin, is Landscape-scale Conservation Planning.